It is said that to prevent rabies you should take the hair of the dog that bit you and rub it into the bite wound. Is there any truth to that? I don’t know. However, based on that saying it’s also said that to cure a hangover, in the morning you should drink whatever you were drinking the night before. 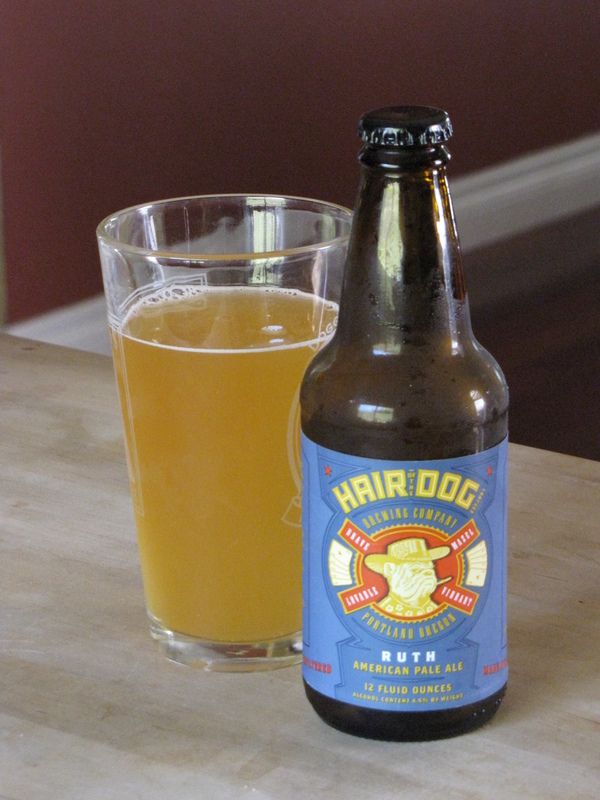 Hair of the Dog brewing company in Portland, Oregon makes great bottle-conditioned beer. But, I don’t see it as the kind of stuff that I’d get a hangover from. For me, they make sipping brews. These are fine crafted beers that I like take my time with and savor the flavors. I’ve already spoken my mind on Hair of the Dog – Adam. So this time I am taking a peek at Ruth. Ruth is a light and refreshing American Ale, made with pale malt and crystal hops. She was inspired by my Mother’s Mother, Granny Ruth because of her love and support. Don’t be Ruthless. Have one on Granny. 1995 was a long time ago, and at that time I’m sure they hadn’t yet conceived the recipe for Ruth, which is an American Pale Ale. My bottle of Ruth poured an unfiltered golden color with very little head that dissipated quickly into the beer. I’ve heard others say that it was overly carbonated, and the head overflowed their glass, but not in the batch I had. It’s got a great nose to it, with floral notes, bready yeast, and a hint of floral lemon and citrus sour. It’s very drinkable with clean malt flavors, and subtle floral and citrus hops. The breadiness from the yeast is one of the more interesting things about the beer and was a bit overwhelming at times. Not what I was expecting in an APA. But I still enjoyed the beer and found it very light and refreshing. I will definitely buy this one again when I see it, and may even age a bottle next time to see what develops. This would be an excellent summer beer. This is a 3.5 cap beer in my opinion. This entry was posted in Ale, American, Pale, Review and tagged Ale, American, APA, Hair of the Dog, Pale, Pale Ale, Ruth by Erik. Bookmark the permalink.